It is one thing to hit the gym and another to be in love with fitness. Most people who visit the gym don’t really see the need for going extra miles to achieve a perfect body while others sacrifice a whole lot to develop their musculature for various purposes. For Natasha Aughey, fitness is not just the only key to achieving personal goals and keeping in touch with health but a way also to inspire people to become what they want to be. Most women have mentioned Aughey as a special gift and inspiration to those struggling to build their muscles. In all fairness, she deserves all the praises and commendations, because she is good at what she does and her works do speak for themselves. Join us as we unveil all the facts about the fitness model. The first thing that is easily noticed about Natasha Aughey is her powerful and masculine physique. While she is already an internet icon, in real life, Aughey often shies away from disclosing detailed information about her personal life and family background to the ever-curious media. However, some sites who dug deep into her life reported that the fitness model is a native of Ottawa, Ontario, in Canada. Moving further, Natasha is said to have developed a penchant for sports from childhood. In her younger age, she took part in numerous sports such as soccer. She started visiting the gym during high school days and the first task she engaged in at the time was performing cardio. Aughey spent a couple of years working to achieve the perfect body she had always wanted but couldn’t make headway as she was only losing weight and not developing curves. After deep thought, she decided to seek the advice of other gym goers and the feedback she got was what transformed her body and career after it was implemented. In order to sculpt her dream figure, Natasha Aughey was asked to switch to weightlifting. At the long run, the fitness model was able to carve the kind of body she has always wanted through diet plan and intensive training routine. Today, Aughey is a social media darling and a major inspiration to many women. Initially, Natasha had wanted to train and stay fit for herself but she was encouraged by her friends to create a platform online where she can share her fitness journey with other people. So, in the year 2013, the model uploaded her first content on Instagram. Although her post didn’t earn her much views and fans; she kept pushing through for the next three years when she eventually achieved an incredible milestone in her career. She currently boasts a large audience on social media outlets like Facebook, Twitter, and Instagram. Aughey basically uses these platforms to get closer to her fans. Her Twitter handle is @natashaughey and you can hook up with her on Instagram via @natashaughey_. 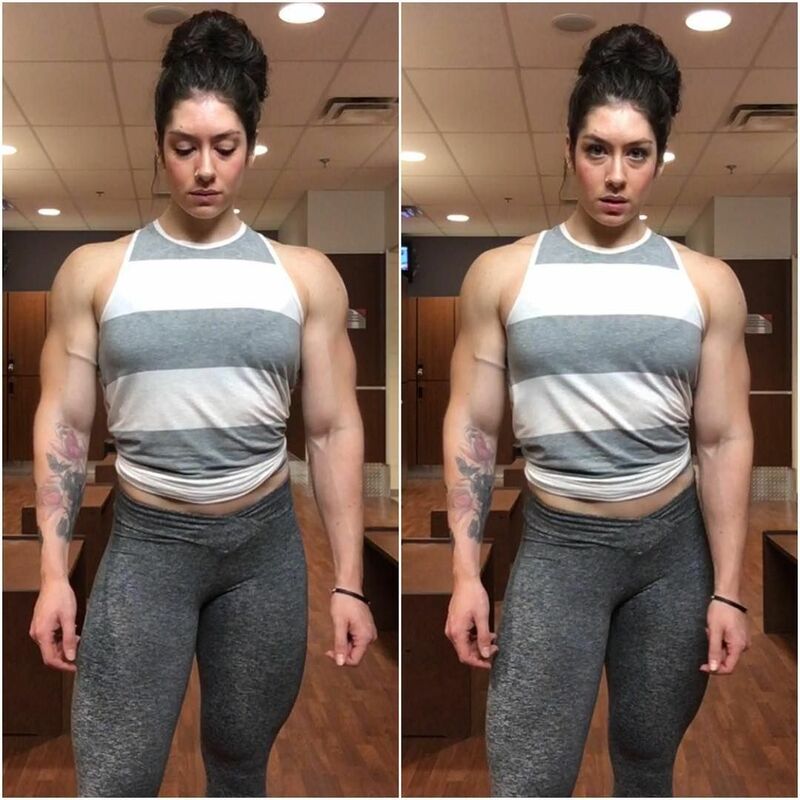 Natasha Aughey is obviously not the tallest fitness model we have met but her height of 5 feet 6 inches (1.68 meters) has never posed any challenge to her fast-growing career. Being a top-notch fitness model, Aughey has a comfortable weight measured to be between 65-70 Kilograms. The superstar has black natural hair and dark brown eyes. She is yet to disclose details of her body measurements and sizes of her dress and shoes. 1. The Canadian fitness model usually hits the gym 6 days a week and then takes one day to relax her body and recover. As culled from her workout plan, she works on her back on the first day. She uses the second day to work on her hamstrings and glutes. She gives her chest and bi’s full attention on the third day while she concentrates on her shoulders/triceps and leg plyometrics/quadriceps on the fourth and fifth days respectively. Aughey dedicates the sixth day to her shoulders. 2. Natasha Aughey mentioned that her favorite food is rice, chicken, and green vegetables. 3. Surprisingly, the model doesn’t have weekly dietary plans but this has never stopped her from taking in nutrient-dense dishes. 4. The brunette beauty has more than 13,000 subscribers on her YouTube channel. She reportedly created the channel on September 21, 2015.